I’m working on a very large business card reprint job this weekend and have been chained to the guillotine cutter all day. As I mentioned in a previous post, when cutting 100% cotton paper you have to trim all four sides with the clean edge of the blade in order to avoid that fibery-looking edge. A lot of work, but SO much easier with a good machine. 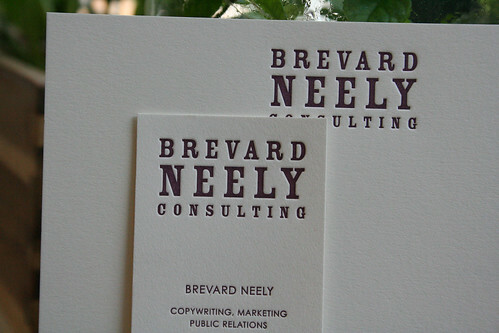 This week I printed some identity items for Brevard Neely, a cool client in Denver, Colorado. 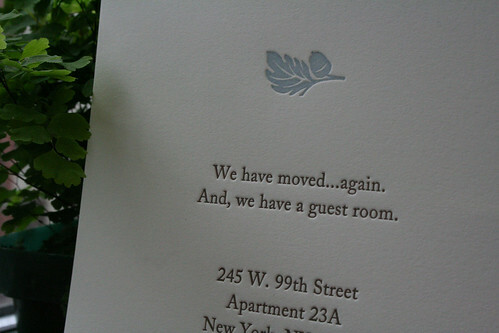 She went with a very nice dark plum color on natural white paper stock. 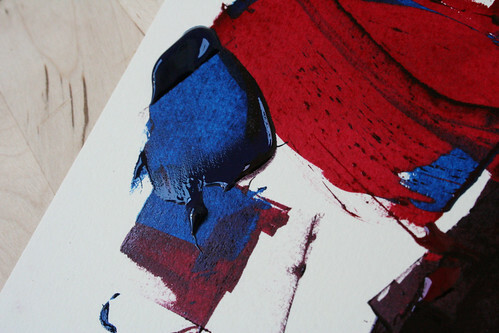 The ink combination included process blue, rubine red and a little black. 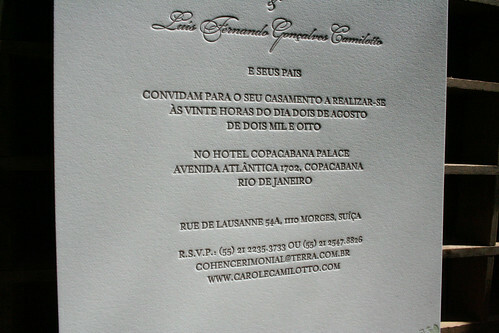 This week I had the pleasure of working with a very nice couple getting married in Rio de Janeiro this summer. 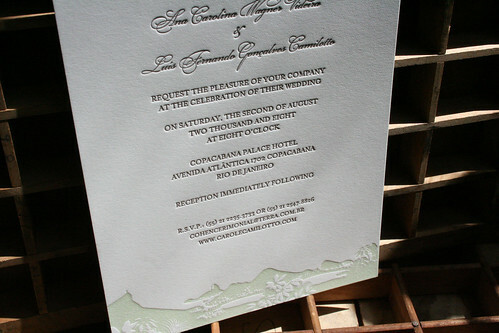 The (gorgeous) landscape design was created by Brazilian designer Jorge Videira, who also happens to be the bride’s father. It was a little sunny in the studio while taking these photos, but it captures the mood nicely. I love collaborating with clients, and this project was a real treat for me. I’m a little behind this month with the April card, the fourth in a series by illustrator Jessi Klein! 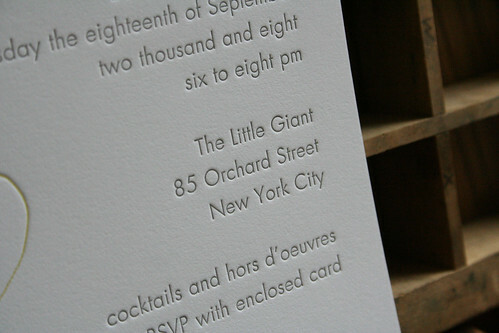 This has been a busy week with 2 weddings and (gulp) taxes… But I’ll take some pictures this weekend and post them soon. 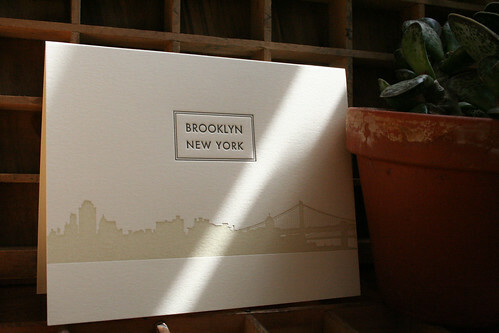 Sunday is another Brooklyn Flea day, I hope its a little sunnier this week! Still recovering from yesterday’s very crowded flea market. It was fun and bustling despite the chilly weather, check out the progression of the day in these great photos posted by the Brownstoner. 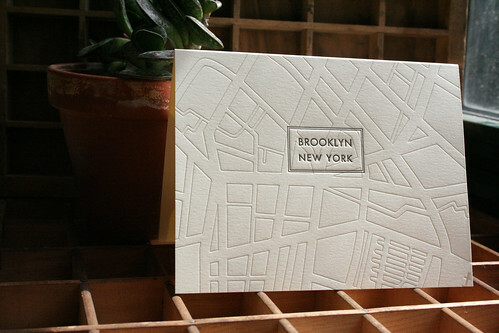 I’m so excited for the Brooklyn Flea Market to begin this Sunday. 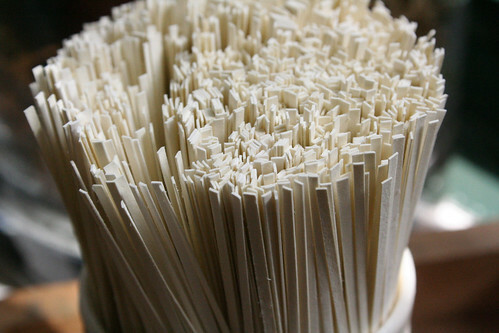 Breck (Sesame Letterpress) and I will be sharing a table in the Design*Sponge section of the market. 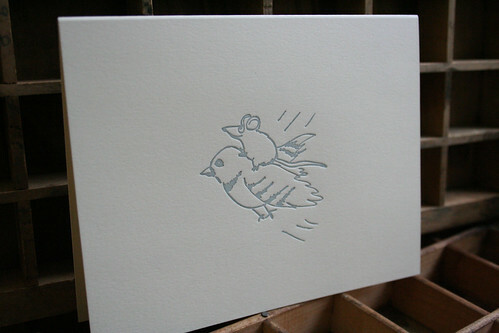 I’m going to be selling some new designs of cards and journals. Directions to the Flea Market can be found here, stop on by of you’re in the neighborhood!